Society for Technology and Development (STD),Mandi (H.P.) 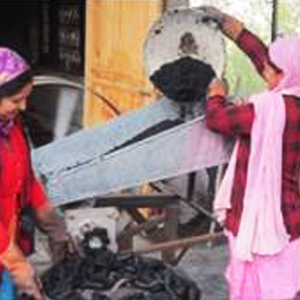 has implemented a project on the up scaling of pine needles briquetting technology through women based community organizations in the Hilly areas of Mandi District of HP. This project has been supported by GEF-UNDP CEE Small Grant Programme. Three villages were selected in the vicinity of the pine forests of Sadar Mandi, Distt. Mandi (H.P.). 3 women SHGs were formed in the villages of Talhar, Punerdhar & Tikker wich involved 38 women members. They were educated on the impact of climate changes on biodiversity & other systems. 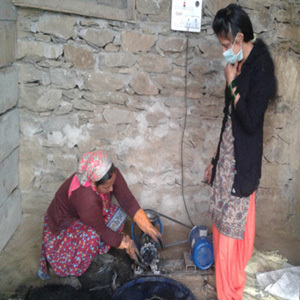 These women groups were trained in the technology of pine needle briquetting. Store rooms for pine needles were constructed in the villages. Additionally machineries and other required accessories were installed in the villages. These groups have also been linked to banks & are in process to avail credit facilities from the banks. After the completion of project these groups are engaged in production & marketing. 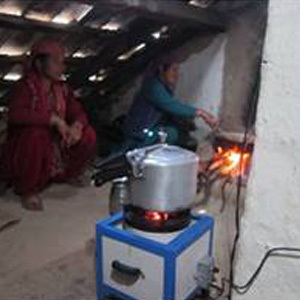 They use the briquettes at home in energy efficient cook stoves, which has led to reduced use of fuel wood & availability of clean fuel at home. Rest of the briquettes are sold to FARMERS unit which is also a women enterprise, promoted by STD. This activity has THUS become self-sustainable & economically viable as it is provides employment opportunities to 15 women (full time) at production centers & 30 women (part time) in collecting pine needles from the forest. During the first year they have used approximately 60 tons of pine needles & produced about 17 tons of briquettes. This has thus avoided the use of about 51 tons of fuel wood, avoiding about 140 MT of CO2 emissions in the environment. The organization now is in process its model to other villages in the District.